World War One left a profound mark and a great deal of damage in the Auronzo Misurina areas. 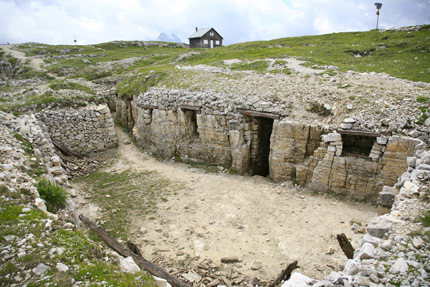 The Austrian-Italian front line passed right along the mountain ridges encircling the valley: trenches, tunnels and monuments and other finds are still visible here especially at Monte Piana with its open air museum and history museum at Rifugio Bosi. The Monte Paterno tunnels next to the Tre Cime are a spectacular work of military engineering. Military fortifications such as forts, tunnels and gun placements dating to World War One but never used are visible in Vigo on Col Ciampon and Monte Tudaio while the Vallo Alpino Littorio underground defences were built by Mussolini from 1939 to 1942. The Col Vidal fortifications on the Pian dei Buoi high plateau in Lozzo, built in 1914, were designed to defend and control the Piave valley They consist of a complex system of defensive structures including two barracks and a reinforced gun battery as well as complementary work (trenches, shelters, anti aircraft positions, field gun placements and bunkers). The Strada del Genio was built precisely to give access to Col Vidal and given this name by local people because it was built by the Genio Militare. It climbs uphill for 18 kilometres gaining around 1100 metres in altitude in a sequence of hairpin bends and dry stone walls from Lozzo di Cadore town centre in the direction of Sorasale and Le Spesse all the way to ‘la monte’.